While I’m mostly submitting stories to pro-magazines, or sometimes self-publishing, I’m still managing the occasional flash piece. My new little zombie story Bailey’s Smile has just been published at MicroHorror. I’m sure no one will notice the little grammatical glitch I missed in proofing. Hope you enjoy the story. This entry was posted in fiction and tagged flash fiction, free fiction, horror fiction, microhorror, zombies on 25 May, 2012 by Sean Monaghan. Corey stared through the Astoria’s viewport at the battered Bergamot. Years amongst explosion debris, and tidal stresses from the gas giant system, and from swollen and pocked Bellatrix, made her look like a lump of dead coral. The ship seemed modular though the briefing said she was a bulk carrier. “I never thought you’d notice me,” he said, staring at the shard that had once been a spaceship. 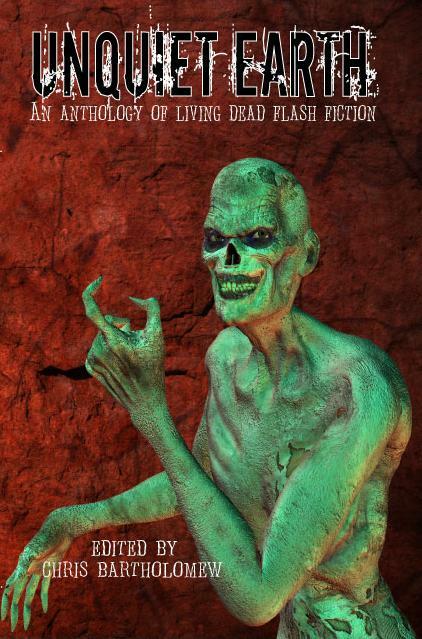 This entry was posted in fiction and tagged chris bartholomew, flash fiction, science fiction, static movement, zombies on 22 April, 2011 by Sean Monaghan. 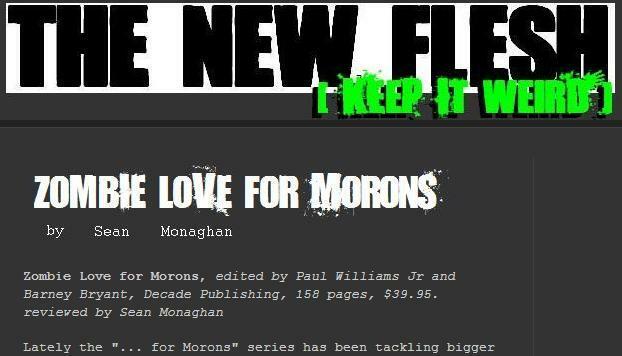 Well, it’s Christmas here, but my special Christmas Eve story “Zombie Love for Morons” should be appearing in The New Flesh right about now. I’ve always thought those “for dummies”, and so on, series had a kind of built-in problem, but they seem very popular (our library has around 150 titles – thinks like “Rugby Union for dummies” [well, duh], Golf Rules and Etiquette for dummies”, “SQL for dummies” [I mean, how many dummies are computer programmers?]). Zombie Love seemed like a good topic to parody that – but how to do it without getting too boring? Flash fiction, of course. How to write it as flash – ah, well, that’s the approach: have a read. This entry was posted in fiction and tagged flash fiction, humourous fiction, new flesh magazine, parody, zombies on 25 December, 2010 by Sean Monaghan. Carrie Ryan‘s young adult novel The Forest of Hands and Teeth is perhaps one of the most extraordinary works I’ve read all year. This horror novel is remarkably literate and astonishingly well-paced. Somehow Ryan manages to balance an unusual setting and circumstance – an isolated village – with conflicted relationships – Mary, betrothed to Harry, loves Travis his brother while Cass, Mary’s best friend, betrothed to Travis is keen on Harry (sounds straightforward, but really it’s not and it really adds an enormous level of tension to the book). And, though it’s amazingly well done, it’s a zombie novel, even if the word “zombie” is never used in the text. Actually, the unconsecrated, as they are known, provide a somewhat evil backdrop to the controlling religious order which governs life in the village. Be prepared – the novel is harrowing and intense and a great character and relationship study. Cool – in checking out Carrie Ryan’s details, I’ve discovered there is a sequel, and a third book coming. Ryan’s also got some stories in anthologies which seem to be set in the same milieu (okay, actually, I think I’d like to see some of her writing set outside that – she’s such a precise and crafty wordsmith that it would be good to see what she’d do with other stuff. Like vampires). This entry was posted in fiction and tagged carrie ryan, reading for writing, the forest of hands and teeth, zombies on 20 May, 2010 by Sean Monaghan. New story -“To hold her one last time” – just out on Microhorror now. Yep, I succumbed and wrote a zombie story. This entry was posted in fiction and tagged flash fiction, horror fiction, microhorror, zombies on 15 June, 2009 by Sean Monaghan.